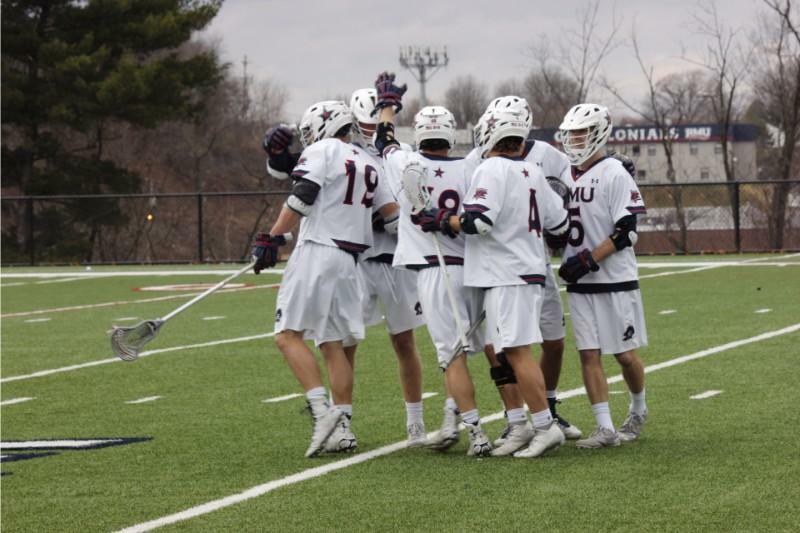 MOON TOWNSHIP, PA–The Robert Morris men’s lacrosse team (2-7, 1-2 NEC) are looking to rebound after a tough start to their season. The Colonials will look to even their Northeast Conference record when they take on the Wagner Seahawks (2-8, 0-2 NEC) on Saturday afternoon at Joe Walton Stadium. The Seahawks have had a rough start to the year themselves, also sitting near the bottom of the standings. Before these two teams square off on the field, let’s take a look at how each squad compares before a possibly strong turning-point matchup this weekend. Recapping Robert Morris: The Colonials finally got a touch of the winning side as they notched their first NEC win of the year against Keystone State rival St. Joseph’s in Philadelphia last Saturday, taking down the Hawks 15-9. Corson Kealey found the back of the net four times in the win, along with Matt Smith to lead the Colonials offensively. Star netminder Alex Heger shut down SJU’s shots from every angle to give RMU a much needed win as the season continues on. Scouting the Seahawks: Similarly to Robert Morris, Wagner has had their own abysmal start to the season. They possess one more loss than the Colonials at 2-8 overall, and remain winless after their first two NEC matchups with an 0-2 record on that end, the losses coming to Hobart and Bryant respectively. In both of those setbacks, the Seahawks gave up 13 goals to the opposition, only amassing 11 goals total in both of the defeats. In their most recent defeat to the aforementioned Bulldogs, Wagner’s Spencer Kaufman was the lone bright spot for the green and white, as he netted his 14th and 15th goals of the year. Of note prior to this matchup, the Seahawks have not won a single game against RMU in 12 tries against the red, white, and blue since their first meeting all the way back in 2007. The most recent showdown saw Robert Morris emerge victorious 15-5 in April of last year. Corson Kealey and Ryan Smith (RMU): Smith and Kealey are two players who have become sheer offensive powerhouses despite the less-than-stellar start for the Colonials. Smith leads his team in points with 22 goals and 12 assists for 34 points, while the returning veteran Kealey leads in goals with 25 total, and has 6 assists for a total of 31 points, three behind his teammate. If these two start to heat up early on Saturday afternoon, seeing Wagner’s previous results, the Seahawks will have a nearly impossible time trying to contain the two powerhouse threats moving up the field. Dominic Branda and Spencer Kaufman (Wagner): While Kaufman has already proven himself as a standout player for the Seahawks, the Colonials will have to worry equally about his fellow scorer Dom Branda, who leads his squad in goals and points with 16 and 21 respectively. Like the goal for Wagner against Kealey and Smith, the Colonials cannot let either of these players heat up quickly or they will hand RMU a tough loss in this key stretch of conference play. Prediction: I have no doubt that this will be business as usual for RMU against a team that, while similar to them, has not beaten them in any of their previous games. I believe that Kealey and Smith will get hot in the scoring category and Heger will put in another stellar performance in net with help from the staunch defense as RMU will beat Wagner 14-6.